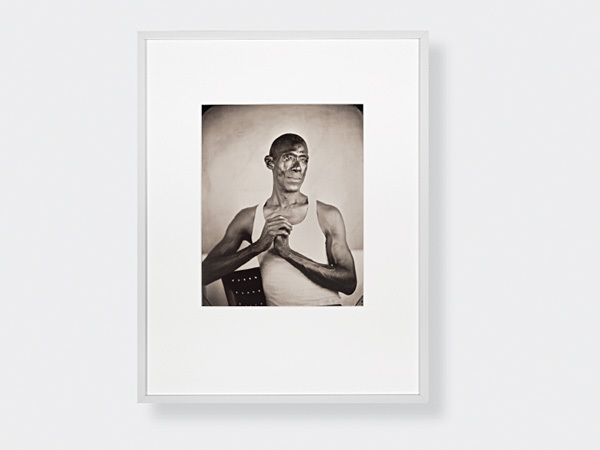 For her series [Hyphen] Americans, Keliy Anderson-Staley has created a vast, broadly diverse collection of portraits with the wet-plate collodion process using nineteenth-century chemical recipes, period brass lenses, and large wooden view cameras. Each individual – identified only by a first name – defiantly asserts his or her self, resisting any imposed external categorizing system. At once contemporary and timeless, these portraits raise questions about our place as individuals in history and the role that photographic technologies have played over time in defining identity. This portrait of Kevin, captured in Syracuse, is reproduced here from a wet-plate collodion tintype as a beautiful and collectible print. Her work has been exhibited at The National Portrait Gallery at the Smithsonian, Washington, DC; The Portland Museum of Art, Portland, ME; The Southeast Museum of Photography, Daytona, FL; Catherine Edelman Gallery, Chicago, IL; and The Palitz Gallery, Lubin House, New York, NY, among other venues. Anderson-Staley participated in Light Work’s Artist-in-Residence Program in 2010. This Fine Print Program purchase includes a subscription to Contact Sheet. Click here for more info about this print, or to browse for others. NEW: Frame any print for just $150! Options available at checkout.